This recipe is by Chef Nik Michael Imran. 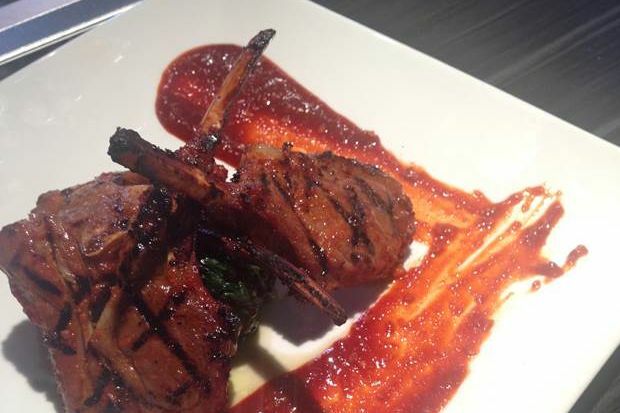 Season lamb cutlets on both sides with salt, pepper and lightly glaze with olive oil. Combine Korean chilli paste, garlic, ginger, soya sauce and sugar in a bowl and mix well. Store half as sauce, use half for marinating. Marinate the cutlets with the paste. Cover every bit of the meat but avoid the bones as the sugar will caramelise and burn the bones when the lamb is on the grill. Cover and keep in fridge for a minimum of 24 hours. Grill cutlets once marinated. We recommend medium for well done. In a pan on high heat, saute garlic in olive oil for 30 seconds (careful not to burn garlic) and add spinach. Saute for 1-2 minutes until leaves turn dark green but do not become too soft. To plate: Pile sauteed spinach in the middle of the plate, stack three pieces of grilled cutlets on the spinach, bones pointing up. Dot a corner of the plate with 1 1/2 tbsp of chilli paste and spread with spoon in a single stroke for drama. Serve.